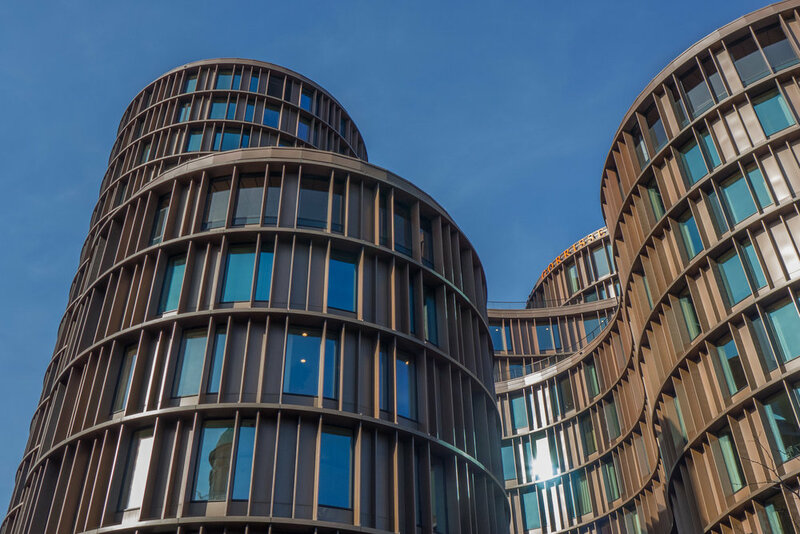 It has been announced that Axel Towers by the architects Lundgaard & Tranberg won the popular vote for the best of the buildings that received an award this year. It is an interesting choice … partly because the site is immediately opposite the main entrance into Tivoli so it is prominent and people are quite rightly fond and defensive of the gardens … and partly because it is in many ways an unconventional building so round in plan rather than square and tall for the centre of the city and a return to darker facing materials after decades of glass. A gross generalisation but generally true although bronze and tombac have been used for some recent buildings. The site has had a mixed and slightly troubled history and the controversies will continue as there are proposals for massive redevelopment with more tower buildings immediately to the north. This feels like being very much in the centre of the historic city if you arrive nearby at the main station by train but the first building on this site went up in 1881 because until then this was part of the ramparts and only became available for building after the defences were dismantled. Tivoli garden immediately south has parts of the water-filled outer ditch. That first building included National Scala … a theatre or music hall. In 1953 the building was converted to a department store for Anva who in 1957 replaced the building with a new building in concrete although that building survived for just 30 years until the store closed in 1987. A third building on the site, Axeltorv 2, was designed by Mogens Breyen and Peter Hammer and completed in 1989 and actually won the building award in that year. There were shops, restaurants, a fitness centre and disco here and part of the scheme was the public square to the west with sculpture by Mogens Breyen - all very post modern and, fortunately, not fashionable now. Simply in terms of taste I’m relieved that post modern has not survived to be my modern … if that makes sense. There were schemes for the site from Henning Larsen, a scheme for two intersecting towers by Schmidt Hammer Lassen and a design for a twisting tower here from Bjarke Ingels. Then in 2010 the developers were declared bankrupt before any of these schemes could be taken forward. With a new company the old buildings were demolished in 2012 and incredible excavations began with an absolutely massive hole for underground car parking and the foundations of the new award-winning building.